“As the forces [of sin] around us increase in intensity, whatever spiritual strength was once sufficient will not be enough. And whatever growth in spiritual strength we once thought was possible, greater growth will be made available to us. Both the need for spiritual strength and the opportunity to acquire it will increase at rates which we underestimate at our peril” (“Always,” Ensign, Oct. 1999). The Nephites built fortifications that gave them strength in a time of great difficulty. 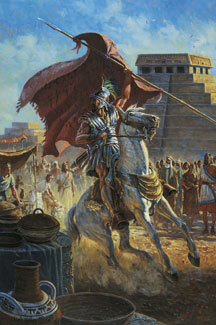 Mormon described Teancum’s stand against the Lamanites using such words as defend, fortify, secure, and strengthen (Alma 52:5-10). We can follow their example by building our spiritual strength now so that we will have the strength we need in a time of difficulty. Spiritual strength is built most effectively by consistent, daily efforts. “Satan’s efforts can be thwarted by all who come unto Christ by obedience to the covenants and ordinances of the gospel. The humble followers of the divine Master need not be deceived by the devil if they will be honest and true to their fellow men and women, go to the house of the Lord, receive the sacrament worthily, observe the Sabbath day, pay their tithes and offerings, offer contrite prayers, engage in the Lord’s work, and follow those who preside over them” (Ensign, Nov. 1987, 34–36). “As the forces [of sin] around us increase in intensity, whatever spiritual strength was once sufficient will not be enough. And whatever growth in spiritual strength we once thought was possible, greater growth will be made available to us. Both the need for spiritual strength and the opportunity to acquire it will increase at rates which we underestimate at our peril” (“Always,”Ensign, Oct. 1999).